The obscene sight of EU officials claiming it would be "wrong" to send the Brussels rice mountain to feed the starving in the drought-ridden Horn of Africa because it will damage the market tells us a lot about the monster which rules us. Italian rice growers pleaded for their stockpiles, hoarded under the ludicrous Common Agricultural Policy, to be used to feed the world's hungry but European Commission spokesman Gregor Kreuzhuber coldly said "No! We have a huge structural surplus and we need to balance the market. "But it's wrong to say this could be solved either through dumping goods on third world markets or by giving it away as food aid. We need to reform the sector," he said. The Italian Rice Industry Association (AIRI) said EU paddy rice stocks of 500,000 tonnes, nearly half of which are of Italian origin and 20 per cent of the EU's annual production, were in danger of rotting and should be used where needed. The call came after the UN Food and Agriculture Organisation warned that up to 16 million people face starvation in the Horn of Africa, including Ethiopia, Eriteria and Somalia, following years of drought. However, increasing quantities of rice are being poured into so-called intervention stocks, buying in food commodities at guaranteed prices under the EU farm policy. This process under the CAP ensures EU "price stability" rather than increased production and EU calls for "reform" under the so-called Agenda 2000 means slashing jobs and capacity in the industry. AIRI estimated that EU taxpayers had paid over 100 million for the rice stocks and it costs more than 1 million per month to store it. 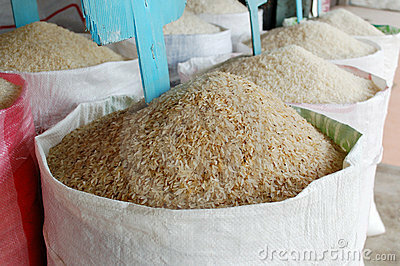 It said delivery of the EU rice stocks to Africa would cut the EU's own costs. "Excessive rice in the EU could be used to reach the needy, and would represent at the same time a considerable saving of resources," AIRI said. AIRI director Roberto Carriere said: "If the European Union does not use these stocks for food aid as quickly as possible, they will deteriorate and have to be destroyed." "While the appeals of the United Nations to rich countries multiply in order to save millions of seriously malnourished people, the EU risks having to destroy thousands of tonnes of rice for which it has paid," he said. This insane example of the destructive nature of CAP can be multiplied by any number of agricultural produce grown within the EU. Ethiopia accused rich countries of waiting until they saw "skeletons on screens" before answering appeals to avert new famines in the Horn of Africa. Oxfam also said aid for Ethiopia was not arriving fast enough and accused the EU of dragging its feet. "The EC failed to meet its commitment last year, providing little more than half the food it promised. It is now more than one year behind on its pledges," it said. This is the reality of Brussels attitude to Africa behind the smiles at the recent EU-Africa summit in Cairo. After centuries of colonial pillage and exploitation EU leaders also had the bare-faced gall to claim that the main cause of low levels of development in Africa was "corruption." The patronising and racist message was clear - it's your own fault. Moreover, Brussels also demanded that Africa drop trade barriers, designed to protect beleaguered African economies, in order to allow EU goods to flood their fragile markets. This is formally organised in the Lome convention between the EU and nearly 70 Afro-Caribbean-Pacific states. However, Egyptian President Hosni Mubarak hit the nail on the head when he said Western aid to Africa had fallen sharply in the last two decades, commodity prices had fallen and the continent's share of world trade had shrunk. "Under these unfavourable external conditions, the African debt crisis has aggravated into unprecedented dimensions," he said. The increasingly colonial attitude of countries like Britain to it's former colonies was also revealed at the summit in verbal attacks on Zimbabwe. Whatever one thinks of the country's elected President Robert Mugabe, Foreign Office Minister Peter Hain is in no position to lecture Zimbabwe that it is "uncivilised" while the UK daily bombs Iraq and helped flatten Yugoslavia last year. Brussels drive to create it's own currency and an army to protect it's interests and compete for resources have been the overriding issues democrats have been campaigning against. However, the democratic movement may also find it fruitful to refocus on the EU's attitude to the third world and the obscenity of food mountain's created by CAP which are larger than ever.